Â A chopper is basically a dc to dc converter whose main function/usage is to create adjustable dc voltage from fixed dc voltage sources through the use of semiconductors. There are two types of choppers â€“ AC and DC. In the case of an ac link chopper, first dc is converted to ac with the help of an inverter. After that, AC is stepped-up or stepped-down by a transformer, which is then converted back to dc by a diode rectifier. Ac link chopper is costly, bulky and less efficient as the conversion is done in two stages. A DC chopper is a static device that converts fixed dc input voltage to a variable dc output voltage directly. 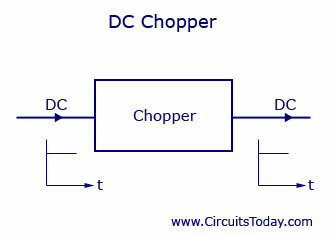 Â A chopper can be said as dc equivalent of an ac transformer as they behave in an identical manner. This kind of choppers are more efficient as they involve one stage conversion. Just like a transformer, a chopper can be used to step up or step down the fixed dc output voltage. Choppers are used in many applications all over the world inside various electronic equipments. A chopper system has a high efficiency, fast response and a smooth control. A chopper can be said as a high speed on/off semiconductor switch. 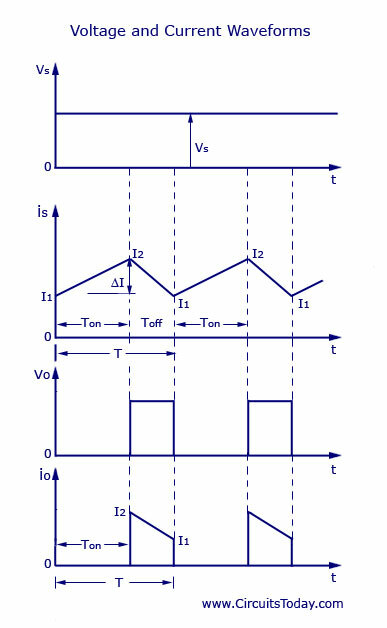 Source to load connection and disconnection from load to source happens in a rapid speed.Â Consider the figure, Â here a chopped load voltage can be obtained from a constant dc supply of voltage, which has a magnitude Vs.Â Chopper is the one representedÂ by â€œSWâ€ inside a dotted square which can be turned on or off as desired. 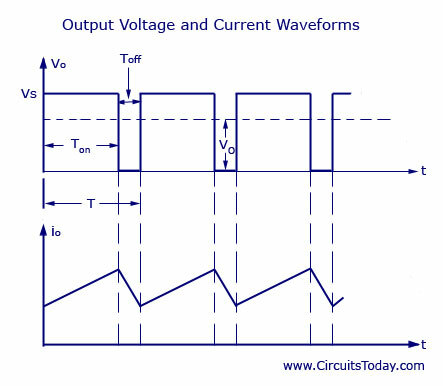 Let us now take a look of the output current and voltage wave forms of a chopper. During the time period Ton Â Â the chopper is turned on and the load voltage is equal to source voltage Vs. During the interval ToffÂ the chopper is off and the load current will be flowing though the freewheeling diode FD . The load terminals are short circuited by FD and the load voltage is therefore zero during Toff.Â Thus, a chopped dc voltage is produced at the load terminals. We can see from the graph that the load current is continuous. During the time period Ton, load current rises but duringÂ ToffÂ Â load current decays . 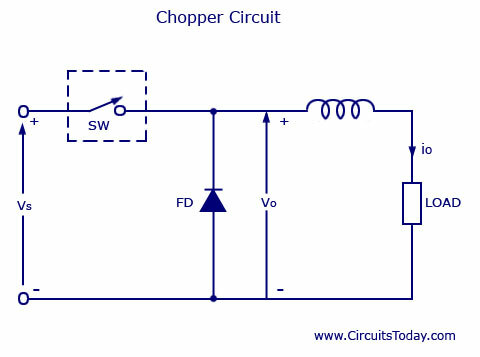 In the case of the chopper circuit (Refer figure named – “chopper circuit”) shown in beginning of this article, V0 Â or the average output voltage is less than the input voltage VsÂ so this type of chopper is called a step down chopper. For a step-up chopper we can obtain an average output voltage V0 greater than input voltage.Â Figure (a) shows the elementary form of a step-up chopper. 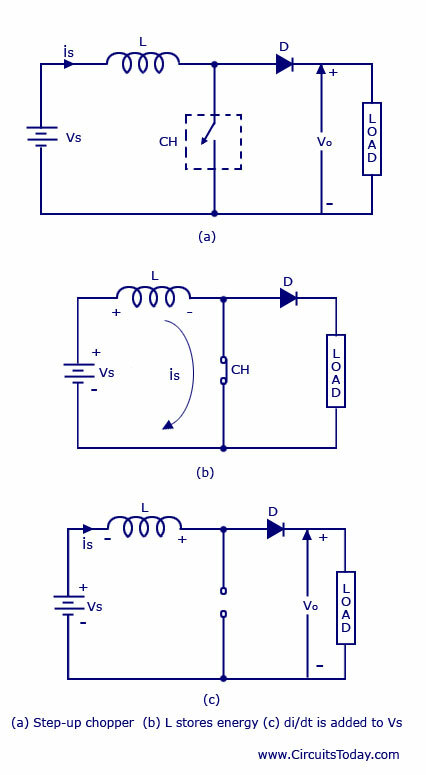 In step-up chopper a large inductor, L is in series with the source voltage Vs. This forms a closed path as shown in the figure (b). During the time period Ton the chopper is on the inductor stores energy. When the chopper is turned off the current is forced to flow through the diode and load for a time Toff and as the inductor current cannot die suddenly. When the current decreases the polarity of the emf induced in L is reversed. Fig (c). As a result the total voltage available across the load is given by the equation V0Â Â = VsÂ + L (di/dt) . The voltage V0 exceeds the source voltage and hence the circuit acts as a step-up chopper and the energy which is stored in L is released to the load. When the chopper is turned ON the current through the inductance L will increase from I1 to I2. As the chopper is on the source voltage is applied to L that isÂ vL = VSÂ Â . Let us assume that the system is lossless, then the two energies say WinÂ and Woff Â are equal. From the equation 2.0 we can see that the average voltage across the load can be stepped up by varying the duty cycle. If the chopper in the figure (a) is always off, A=0 and V0= Vs. If the chopper is always on, A =1 and V0 = infinity as we can see from the graph. In practical applications the chopper is turned on and off so that the required step-up average output voltage, more source voltage is obtained. 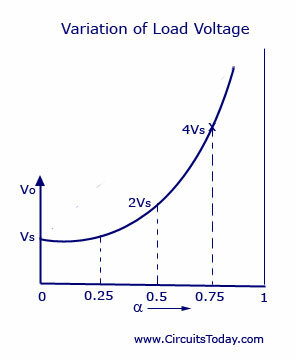 Â Figure shows Â variation of load voltage V0 with duty cycle . Figure shows regenerative braking of dc motor. The principle of step-up chopper can be used for the regenerative braking of DC motors. The armature voltage Ea Â is analogy to the VS Â Â and voltage V0 is the dc source voltage. When the chopper is on the inductor L stores the energy and when it is off the inductor release the energy.Â IfÂ Ea / (1-A) exceeds V0 , the dcÂ machine will work as a dc generator and the armature current will flow in a direction opposite to the motoring mode. As the power now is flowing from dc machine to the source V0 it will cause regenerative breaking of the dc motor.Â Even at decreasing motor speeds, regenerative breaking can be provided as the motor armature Ea is directly proportional to the field flux and motor speed. It is assumed that energy supplied to inductor is equal to energy supplied by chopper when the chopper is in off state. How can we say that they are equal? Maybe before all the energy is supplied by the inductor, the chopper turns on again. Is this same same as clipper and clamper circuits ? It can be considered as an analogy to clipper and clamper circuit, the basic difference here is these are controlled by external signals and depend on the triggering time which is not in the case of clipper clamper circuit which is diode based. But why at all we should use this power supply when new technology SMPS supplies are available in ample range. The actual purpose of using this type of power supply is not explained here.